Amazing and extensive ruins of the castle Toledo is one of those views with which nobody can understand how they have stayed, this castle give the merits of past times. The ruins of the castle rise majestically on a small hill that dominates the little village of the same name. It is located about 20 km southeast of the city of Toledo in the Spanish province of the same name. It is believed that Almonacid de Toledo Castle was probably built by the Moors. For the first time for this massive fortress in its prototype, when it was so big and powerful, it has been mentioned in 848 and 854 years. 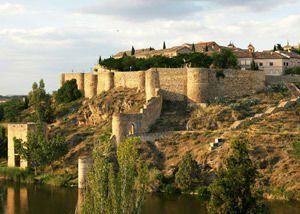 At that time, the castle becomes an arena of fierce battles between troops of the Emir of Cordoba and the rebels of Toledo. According to one legend, the name of the castle comes from a Spanish word that means "The battlements of El Cid". El Sid is a very famous Spanish horse, which plays a major role during the battles. More likely, however, the name of the castle came to Toledo from the Latin word "almonaster", which means monastery. Moors are a stranger to this and called the castle "ribat", which is their word for monastery. At that time the fortress was inhabited by monks, and Moorish knights. Toledo fortress fell into the hands of King Alfonso IV, as part of the dowry of his wife - Princess Zaida. In 1086 the king donated the castle to the Archbishop of Toledo. In the 14th century, Archbishop Don Pedro Tenorio made substantial reconstruction and strengthening of the fortress. Later, when the Portuguese pretender Count Alfonso of Gijon was to the throne, the castle was closed by order of King Juan I, who was king of Castile. On August 11th 1809, the castle served as a refuge for the Spanish troops under the command of General Venegas in a battle against French forces. This confrontation ends with victory giving around 2000 victims, and about twice as many Spanish soldiers killed near Toledo. Inside the Almonacid de Toledo Castle you can see the remains of defensive walls of 2 square meters and three round towers. Besides viewing the remains, the buildings beyond its walls of the fortress have ruins of the square three story fort and a few tanks.